Overview... a 40-something woman who time-travels back to her senior year of high school. 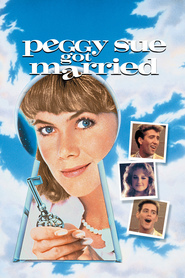 Peggy Sue attends her 25th high school reunion just after splitting with her philandering husband Charlie, who was her high school sweetheart. But when Peggy Sue faints at the reunion and suddenly finds herself transported back to 1960, she has to decide whether to stick with Charlie – they got married right after high school because Peggy Sue got pregnant – or blaze a different path. Personality... caring, responsible, and a bit disappointed with life. When Peggy Sue is 18 again, she remembers just how free and full of life she was before the responsibilities of raising a family took precedence over everything else. Now that she has an apparent do-over, she wants to explore every option she might have had, since she already knows how the path she took ended up. Or does she? Just as her time travel helps her see herself through new eyes, maybe she’ll view the rest of her life differently too – including Charlie. Peggy Sue Bodell's popularity ranking on CharacTour is #4666 out of 5,000+ characters. See our top-ranked characters and read their profiles.